Year 9 pupils visited the New Walk Museum to meet the great grandson of a Leicester Suffragette, Alice Hawkins! Alice Hawkins was 43 and working in a Leicester shoe factory when she first joined the movement to give women the right to vote. 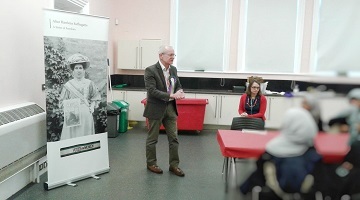 2018 marked 100 years since women won the vote.The pupils had the opportunity to ask questions and view original items belonging to Alice Hawkins. Walking through the exhibition pupils got a sense of how big the movement had become with lots of women from different walks of life, united in their quest to win women the vote. Hearing Peter Barratt talk about his great grandmother’s experience and the suffragette movement in Leicester, as well as looking at photographs of Leicester in the early 1900’s, pupils were able to feel part of the History as they recognised many familiar landmarks that still stand today. The trip was a valuable and interesting lesson outside the classroom!